More than 70% of EU internet users are concerned about online disinformation before the European Parliament elections in May. Moreover, issues such as a general lack of trust in media and too little data made available to academia and fact-checkers are hindering the EU’s fight against disinformation. Amongst other measures, the European Union has responded to these problems by implementing a Code of Practice (CoP) against disinformation which first results were presented on a conference on Tuesday. 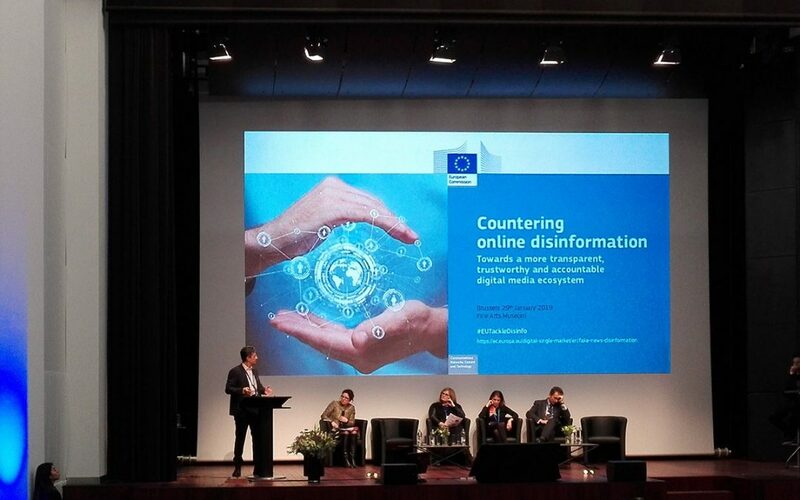 “The fact that we have gone over an hour shows how much interest and how much to discuss there is,” said Claire Bury, Deputy Director General of the European Commission, in her closing speech on Tuesday’s Commission conference ‘Countering online disinformation – towards a more transparent, trustworthy and accountable digital media ecosystem.’ And indeed, there was a lot to discuss. The event drew a balance of the achievements made in tackling disinformation in Europe and looked at its future, especially in view of upcoming free and fair Parliament elections. Some answers to the question of how to tackle disinformation were given, some progress reported on. Yet, many questions were left unanswered. The conference saw presentations of various signatories of the contract. After mentioning that the past years have been “quite a period for us,” the Head of Brussels’ Facebook office, Thomas Myrup Kristensen, argued that the company has stepped up their work to close fake accounts and dubious sites. And while Jon Steinberg from Google acknowledged their wider responsibility as a signatory of the code, he also said that they are only a small part and highlighted the role of NGOs, the media sector, and politicians to counter disinformation by, for example, not further politicizing the term itself. Not every participant in the panel was as euphoric about the CoP. There are no immediate consequences for platforms when not complying with the code, getting citizens involved in the process poses a challenge, and the data made available for third parties such as fact-checkers or media educators remains very limited. In his keynote speech, Director of Research at the Reuters Institute for the Study of Journalism, Rasmus Nielsen, also highlighted the need to get a broader understanding the media environment and the perceptions of people on the problem. Due to a phenomenon called ‘automated serendipity’, using search engines for news leads to a more diverse news consumption and to make users read sources that they would have never found otherwise. However, Nielsen argued that the backdrop of this is that fewer than half of the people can recall where they got their information from. Moreover, it is also important to consider that only 51% of the people that use mainstream media actually trust in it, while the numbers for social media are even lower (23%). As can be seen, many actions have been taken by diverse actors concerning the problem of disinformation and many questions remain to be tackled. “Now, there is a need to coordinate all these actions and bring them together. The Commission has to work on closely monitoring the implementation of the CoP and make sure that necessary data is made available as quickly as possible,” concluded Bury. A full stream of the conference is available via this link.